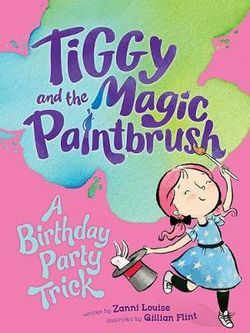 The third book in the Tiggy and the Magic Paintbrush series, A Birthday Party Trick brings with it a birthday party Tiggy is so excited about. You see, the thing she is so excited about is that a REAL Magician is coming to her party. But when at the last minute the magician rings up sick, Tiggy has to spring into action and devise a way she and all her friends still get to enjoy a magical birthday. With the help of her magic paintbrush Tiggy conjures up Paulo the Great but the problem with Paulo is that none of his tricks works -- that’s not until he disappears. Tiggy looks high and low for Paulo the Great, and eventually finds him, but now he is too small. This fun instalment suitable for ages 4 -7-year olds is splashed with colour by the talented illustrator Gillian Flint. Join Tiggy on her birthday and discover as she does that a birthday can be just as magical without a magician.